Yesterday was 8 years since you have been gone in this life … and yesterday was also the “Karthigai deepam” day. Thats the day you had chosen to leave and for the first time your death anniversary date and the “karthigai deepam” day came on the same day. I am starting this remembering with a complaint. Amma doesn’t even recognise me !! Cheenu mama had scanned some old photographs and sent them to me. Here’s one from that set. This photograph was taken during one of our annual trips to Tirunelveli I guess and that trip seems to have coincided with Muthu periyamma’s family being there as well. Chakku, Chellama, sunglass wearing Raman Mama, Periyappa, Cheenu next to you, Lakshmi Mami, Sudha as a baby and of course the three of us. Looks like I had created a scene just before this picture was taken because my eyes seem swollen. Or it may have been on that trip when I caught the dreaded “Madras eye” and Chitappa poured some raw onion juice in my eyes to cure it. Cheenu mama sent many many photographs and they brought back so many memories … there are photographs of Alamelu and Padma when they were little girls, Koka and Rangan when they were young boys. There’s also a few where Amma is a little girl. Here’s one picture to remind you of how Amma looked when you went to see her … you both got married in May 1968 and this is from Jan of the same year. 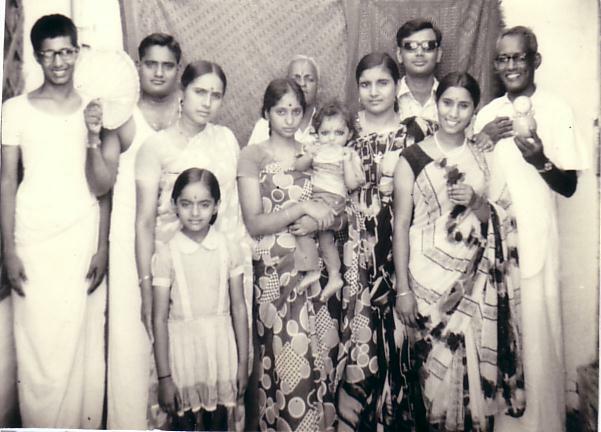 Some of my favourite cousins are here too – Rangan and Koka, Alamelu, Padma, Rajan and Rohini, also Lulu sitting in front of Thatha. I wonder why Amma closed her eyes :):). 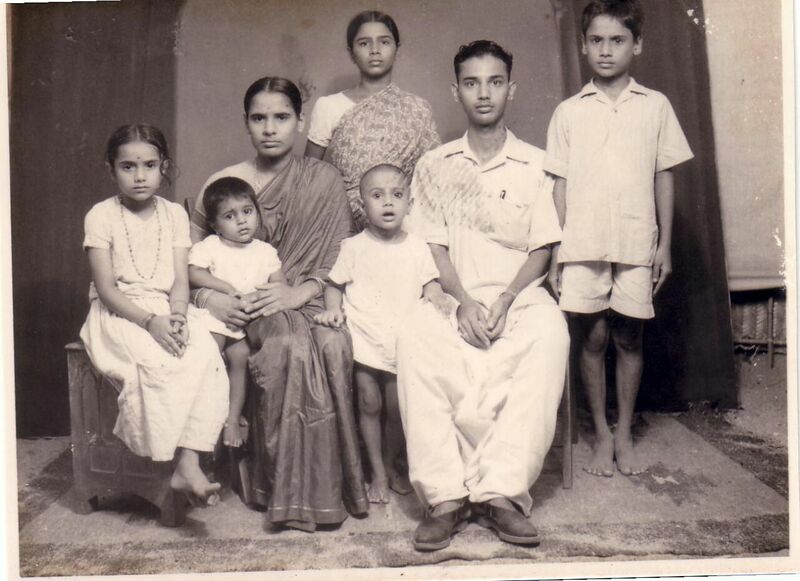 Suseela Mami is standing right behind her and Periya Mami is on the right flank. Ofcourse Thatha and Paati in the middle. Appa, its uncanny to see this photo and realise that Kannan looks exactly like Rangan did when he was this young! Life does repeat itself. Now the following photograph will tell you exactly where I get my “grumpy” “obstinate” look :). The little girl sitting grumpily on the left most is your beloved wife and my dear mother – see, the look?? Exactly how I look when am grumpy. Also Thiruperai periyamma sitting next to Amma and Gopu Mama standing next to Periya Mama are so similar in looks. 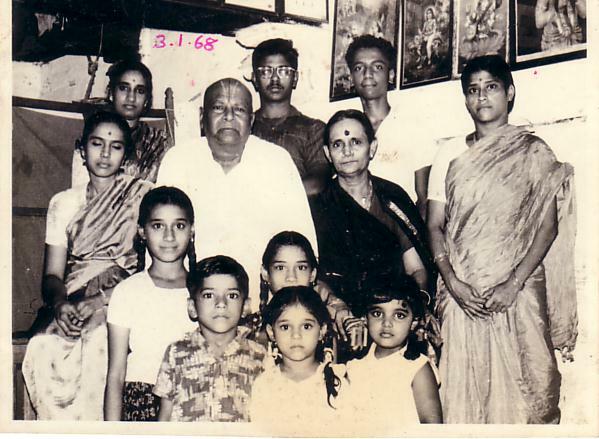 Appa, do you remember we met a friend of yours somewhere who kept looking at Amma and finally asked if she was related to T. Gopalan and then we realised that he and Gopu mama were classmates in college – this photograph proves the similarity in looks. And the next generation too – Ambi looks exactly like Gopu Mama does in this picture. Its like this book that I read sometime back “100 years of solitude” – life has a way of repeating itself. I can recognise Rangam periyama standing at the back but don’t know who the “Mottai” is and the young baby with Thiruperai periyamma. Interestingly enough, I had a grumpy look when I started this blog, exactly like Amma in this picture above because she threw out the Keventers bottles that we had got yesterday! And she told me, she threw them because they were glass bottles and may break. Exactly why I wanted to keep them – because they were glass bottles. I obviously inherited my love of glass from you and not her :):):). Appa, your favourite Cho is no more and Jayalalitha too is gone. There is one demonetised Rs. 500 note which was in your shirt the day you had the haemorrhage in Aug 2008. We haven’t exchanged it and we won’t, its just Rs. 500 and the memory attached to it is much more than the money it represents. We celebrated your day by having dinner with Montgomery and Dan, friends visiting India from the US and Amma spent some time with Danam and Sriram catching up. So all is well… Life goes on.